"Find 'em, Fool 'em And Forget 'em"/"Choo Choo Bop"
"Rock And Roll"/"Hold Me, Baby"
Above: Photo of Doles Dickens And The Whispers. 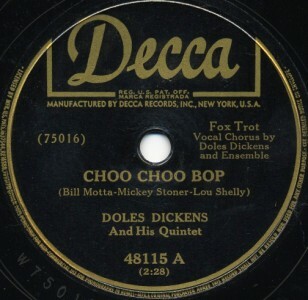 Does anyone know if this is also the Doles Dickens Quintet on Decca? Dickens is playing the bass fiddle. He was previously with The Five Red Caps and The Red Caps Trio. Doles Dickens recorded these Decca tracks in New York City in 1949. Doles Dickens, bass; Joe Gregory, vocals; rest unknown. Doles Dickens began his recording career in 1940, on bass fiddle, with the Eddie South Orchestra. He left them in mid-1943 when he joined The Five Red Caps. He cut a few records with them for Beacon and stayed on with them until 1946 when he went on his own. 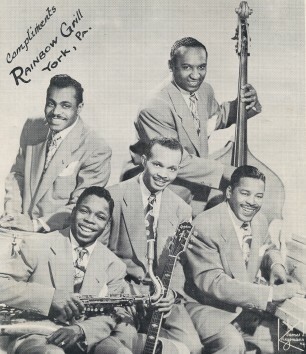 He waxed for Superdisc, Continental and Gotham in the mid-1940's with his own jazz quartet, featuring Herbie Scott, Reuben Cole and Dickie Thompson, then moved to New York in 1949 to record for Decca.... At the same time, he played bass in sessions for Piano Red. He recorded in 1954 as Doles Dickens and the Strangers, and made records at least into the soul years of the mid-1960's, acting as musical director. In 1964 he became a studio session man for the Gotham label, backing up some pop singers. 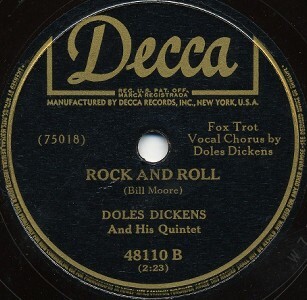 Above: Label images for Decca 48115 and 48110, recorded and released in 1949. All four sides were recorded in the same session. 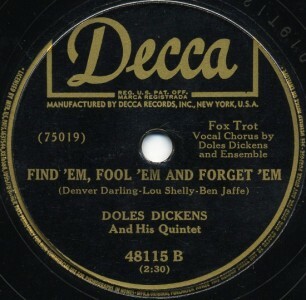 The Doles Dickens Quartet/Quintet had at least one release each on Continental (1947), Super Disc (1947) and Gotham (1949). There were also at least three more releases on Decca by them in 1951.